Whether contra-angle and straight handpieces, air turbines and air scalers, Lubrina offers you highly efficient and user-friendly handpiece maintenance - fully automatic. By replacing the joints, Lubrina can make the maintenance of the contra-angle of Tri Auto ZX and DentaPort ZX, the air turbine handpiece (ISO 9168 joint) and contra –angle and straight handpieces from other manufacturers (ISO 3964 joint). Lubrina can service up to four handpieces in 100 sec. – including lubrication, purging and chuck maintenance. Compared with manual lubrication, Lubrina requires only 1/3 of the lubricant. Lubrina is the first handpiece maintenance unit with a built-in chuck maintenance system (only for Morita's instruments). Featuring a one-of-a-kind dual lubrication system, Lubrina enables lubrication of two instruments with one spray -or, if so desired, the use of two different sprays. Lubrina requires no special spray. It can be operated with any authorized brand by using an optional spray base adapter. The air suction system eliminates lubricant mist, so there is less smell by oil. Excess lubricant goes to the lubricant absorber through a return circuit to keep clean the operating area. To reduce maintenance failure, Lubrina is equipped with a lubrication sensor, signaling when spray is empty with an illuminated light. 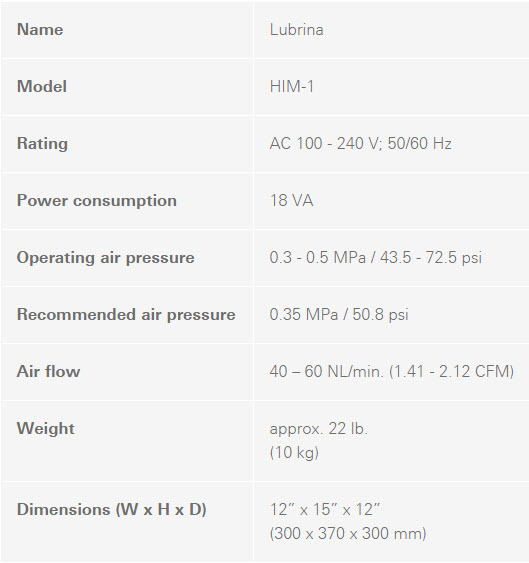 Lubrina allows you to select between two lubrication time modes: short mode and long mode.